This 9x18mm Makarov cartridge by Red Army Standard features a 95 grain projectile. The bullet sports a bi-metal copper-steel full metal jacket, so your accuracy won’t droop as the result of lead fouling during an extended visit to the range, letting you go longer in between cleanings. True to its Soviet roots, this cartridge has a non-corrosive Berdan primed steel casing, so it’s wholly unsuitable for reloading. This cartridge’s attractive price tag is partly the result of that, and if you never intended to handload anyway there is little trade-off to consider. The casing sports a polymer coating, so it will better resist corrosion and feed and eject reliably as well. 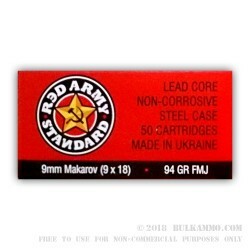 Red Army Standard is a trademark of Century International Arms, who were founded in Vermont and are now headquartered in Florida. The brand caters to the Soviet era weapons enthusiast, and is exclusively produced in Russia and former Eastern Bloc countries.